All pictures, photographs, and writing are copyrighted by the author and owner of Flies Over Nebraska. All rights reserved. Reuse of any photograph, picture, or written content of this blog only permissible by author’s express written consent. Dang it! Thats not the right link. Hey there fellow Nebraskan, just wanted you to know that I shared the facebook link to your blog with both of my friends who work for Game & Parks, just like I said I would. I’m sure they will both enjoy it, and hopefully their friends will too. Keep up the good work! Hey, Thanks for the help! Hopefully something comes of it! Even a few more readers would be nice! I will have to think of a way to pay back the favor! I’ve been thinking of doing a facebook page myself, of course I will alert you. I’m thinking a Nebraska Blogger retreat would be a kickass event to host somewhere. What do you think about that? That would be pretty cool! How many of us are there??? I don’t know. I have a post written about Nebraska, but haven’t published it yet. It invites all Nebraska bloggers to show themselves. Maybe I should go ahead and post it after all. Would care to review it before I publish? I can send it to you via email. Is your email address posted somewhere on your blog? That way you can see it full bore as it would appear on my blog, not just text, which is pretty cool. I’ve been purposely trying to not put my email up publicly! Oh, I totally understand that. I will only sell it to a few mailing lists. Thank you ! You want to link pages? Yep! Let me write a blog post about yours… I’ll try to throw it up on Sunday… my time. I don’t know if you’re head of me or behind me! I think we´re about 6 hours in front of you. Are you interested in joining a fly tying swap? We´re 6 persons now. Contact me if you´r interested! I ran accross you blog and enjoy reading your posts. I do not do the facebook thing, etc., but I do have a blog that I occassionally post things on. It is nebraskasmallstreamtrout.blogspot.com. I am about a year into fly fishing and love fishing on small streams for small trout. I love your passion for the sport and the fact that you get your little girl involved. Have a great day and I look forward to seeing your new posts. I’ll have to add your blog to my feed! Thanks for sharing you blog! I would love to go fishing in Nebraska’s streams. I have mastered warm water fishing, but my few attempts at streams have been tough (except for the North Platte River below Ogallala Lake)! Well, if you ever have an excuse to make it to Western Nebraska and need a guide for the day, let me know. I would be happy to show you around. I would LOVE to do that! I am trying to find an excuse to go out was and trout fish! Glad I ran across your blog. 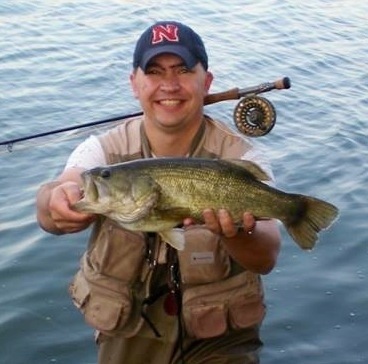 I’m a fellow Nebraskan, love Husker sports, have done a little bit of fly-fishing, am an author as well – with my first book coming out this fall, have one son who is a senior in business at NU and my youngest coming this fall as a freshman in business at NU as well. I guess that gives us some common ground – huh? I guess so! I probably have met your oldest, and will work with your youngest! I’ll be sure to check it out! Thanks!